Home › News › Harley-Davidson, Sailor Jerry To Give Away 22 Custom Bikes! Twenty-two bikes were on display at the Harley-Davidson museum in Milwaukee Tuesday morning as part of the announcement of the multi-year partnership between Harley-Davidson and Sailor Jerry's Spice Rum. 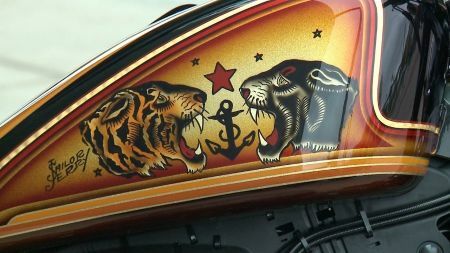 Sailor Jerry's had artists from all over the country design and paint the bikes. Sailor Jerry -- aka Norman Collins -- was a tattoo artist who lived in Hawaii from the 1930s until the 1970s and is widely considered one of the godfathers of modern tattoo art.